Home-grown Maxspid Enterprise makes products that you really do not want to have to look at. But when you do need them, they might just save your life. In a fire or other emergency, the company's exit signs, exit lighting and emergency lights play an essential role in helping people escape to safety. But in everyday life, these products often go unnoticed. Maxspid Enterprise was the first business here to manufacture this type of product, with a history dating back to 1978. Unlike other areas of business, there is little scope for product differentiation or jazzy design elements when it comes to making emergency lighting or exit signs. "It is a regulated industry by agencies such as the Singapore Civil Defence Force, and the standards have not changed much in the last three decades," said general manager James Wong, 31. "What you usually see is a green sign with white letters spelling 'Exit', or its equivalent in other languages." The standardisation is required for fire safety purposes and consistency among emergency light suppliers or makers. This limited opportunity for making products that look different means Maxspid has had to compete on margins and look to expansion abroad to grow its share of the pie. "Maxspid's business falls under low-technology manufacturing, so it was not wise for us to have our products made locally," said founder Jimi Wong, 60, who is Mr James Wong's father. By the 1980s, the elder Mr Wong had shifted production to Petaling Jaya, Malaysia, before moving the manufacturing plant to China in the mid-1990s. To keep costs down, Maxspid relies on outsourcing some components to other companies. "It is like how the auto or car manufacturers do not make the seatbelts themselves, but focus on the more important components and check the final product before it is delivered," said Mr Jimi Wong. Its Singapore base now functions as its headquarters, research and development (R&D) centre and distribution point. 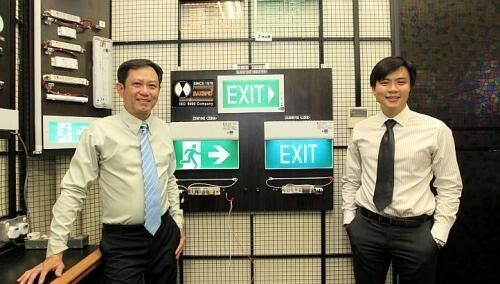 "Although there is little innovation in terms of the external casing or sign, we are always looking for ways to make the light or lamp more efficient," said the elder Mr Wong. A pet cause he has pursued for more than five years is for more buildings to adopt the "Running Man" exit sign, a pictogram which is universally recognised and understood. "Other than further standardising the product in the market for consistency, it also helps businesses like us keep inventory cost low when one sign is preferred." When his eldest child, James, agreed to join the business, it was a relief for Mr Jimi Wong. "When I was 21, my mum died," recounted Mr James Wong. "Her death came as a blow to the family because she was so involved in the business - it was as if my dad had lost a limb." The younger Mr Wong had been to law school and was working as a paralegal, but gave that up to help his father in the family business. "He had always cautioned me about our business being regarded as a sunset industry," he said. "But seeing is believing - and Maxspid has clothed and fed me and two siblings for over 30 years." "So, I thought, why not give it a try?" he added with a laugh. Fortunately for Maxspid, the business benefited greatly just before and during the global financial crisis, as construction activity in Singapore was ramped up. "Our revenue in 2006 was about $6 million, but it has more than doubled since last year," he said, declining to disclose profit figures. It employs about 40 people in Singapore. Its recent projects include installing emergency lighting and exit signs at Resorts World Sentosa, Marina Bay Sands, Changi Airport Terminal 3 and the Marina Bay Financial Centre office towers. Regionally, the business provides emergency lighting for buildings in Indonesia and the Philippines, and hopes to tap into emerging markets such as Myanmar, Laos and the Middle East. Mr James Wong is looking to new markets to carry Maxspid's products. He also believes that as a second generation leader, part of his responsibility is to show proper gratitude to his parents. "I won't forget where my blessings came from and hope to take Maxspid to new heights," he said.